HONOLULU – Mumps, commonly considered a disease that affects only young children, is affecting primarily adults and adolescents in Hawaii. Adults between the ages of 20 and early 40s and adolescents 10 years old and above make up the majority of Hawaii’s recent mumps cases, according to the Hawaii Department of Health. However, the Department of Health offers practical ways to avoid getting the disease. “Based on the cases that we have been able to track, the common denomination has been exposure to some type of gathering, whether school, work, church, family gathering or other social event,” she said. The total number of confirmed mumps cases statewide as of Jan. 4 stands at 770, with 610 on Oahu, 108 on Hawaii Island, 49 on Kauai and 3 on Maui. The ongoing mumps outbreak is by far the worst in several decades for Hawaii, which typically has fewer than 10 cases a year. Dr. Park noted that in previous years, mumps cases were imported, but recently outbreak cases have been acquired locally. What began in March 2017 as two clusters of cases involving nine individuals on Oahu, increased to 500, with confirmed cases in all counties, by late October 2017. Hawaii is not the only state that has experienced a mumps epidemic. According to the Centers for Disease Control and Prevention (CDC), from Jan. 1 to Dec. 2, 2017, 48 states and the District of Columbia, reported mumps infections. In addition to Hawaii, Washington, Texas, Arkansas, Missouri, and New York each reported more than 300 cases in 2017. 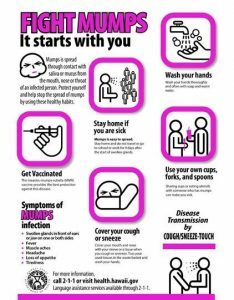 The MMR vaccine prevents most cases of mumps and complications caused by the disease. 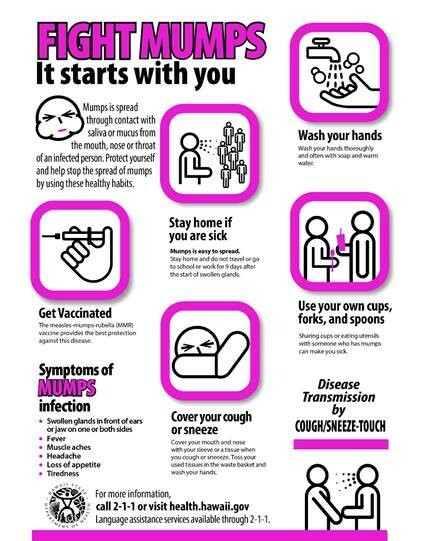 Individuals who have been appropriately vaccinated with a routine two-dose series can still get mumps, especially if they have prolonged, close contact with someone who has the disease, but those who are vaccinated and get the mumps will likely have less severe illness than unvaccinated individuals. “If it were not for our highly vaccinated population, we would expect to see many more cases in individuals exposed to the mumps virus, more severe illness in those who have been sick, and more complications from the disease,” Dr. Park said. The most common symptoms of mumps include swollen glands in front of ears or jaw on one or both sides, fever, muscle aches, headache, loss of appetite, and tiredness. Persons with symptoms of mumps should contact their healthcare provider for testing. Complications from mumps include orchitis (swelling of the testicles), oophoritis (swelling of the ovaries), meningitis (infection of the covering of the brain and spinal cord), encephalitis (swelling of the brain), and temporary or permanent hearing loss. In rare cases, death may also occur. The MMR vaccine is available at local pharmacies. To locate a vaccinating pharmacy nearest you, visit http://health.hawaii.gov/docd/vaccinesimmunizations/vaccine-locators/ or call the Aloha United Way information and referral line at 2-1-1. Additional information about mumps can be found on the DOH website at http://health.hawaii.gov/docd/advisories/mumps/.